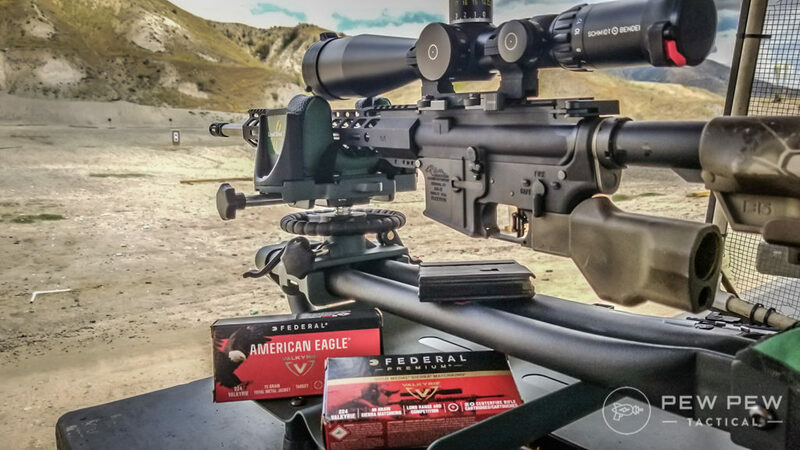 What’s the best upgrade for your AR-15? Besides a bunch of ammo and training courses…it’s swapping out the trigger. Now…there’s A LOT of triggers out there. I’ve shot just about every single one under the sun thanks for industry and media range days. I’ve also bought my fair share of triggers for my amount of lowers. These are my favorites for both drop-in and more traditional models…plus single and double-stage too. And don’t worry…I’ll include budget and duty-rated triggers for those that aren’t looking for 1.5 lb hair triggers. Let’s establish a baseline since I’m going to be measuring average trigger pulls and shooting split times. There’s a lot of variance between mil-spec triggers…but for the most part they have some creep in the beginning, which I’m going to define as when you think the trigger is going to “break” and shoot…but it hesitates and moves again. 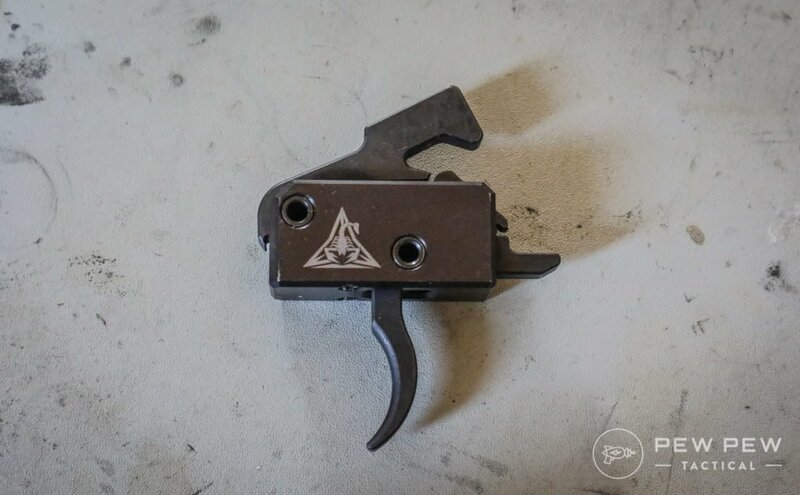 I’ve had mil-spec triggers with a trigger pull in the range of 6 to 9 lbs. This one I’m testing is a decent one at 6 lb 9 oz (all of these are measured on my Lyman Electronic Trigger Pull Gauge). Watch the video (I’ll have one for each trigger) to see the creep in the front…with some “over-travel” (how much the trigger moves after it breaks) and then a very solid reset. I’m shooting UTM Battlefield Blanks with the barrel pointed in a safe direction and everyone is wearing eye/ear protection. Here we also see the “split time” of .22 sec which is the time between shots. It’s not a perfect measure (since I’m not a robot) and sometimes you’re looking for precision instead of the fastest pull. But it’s what I’ve got! 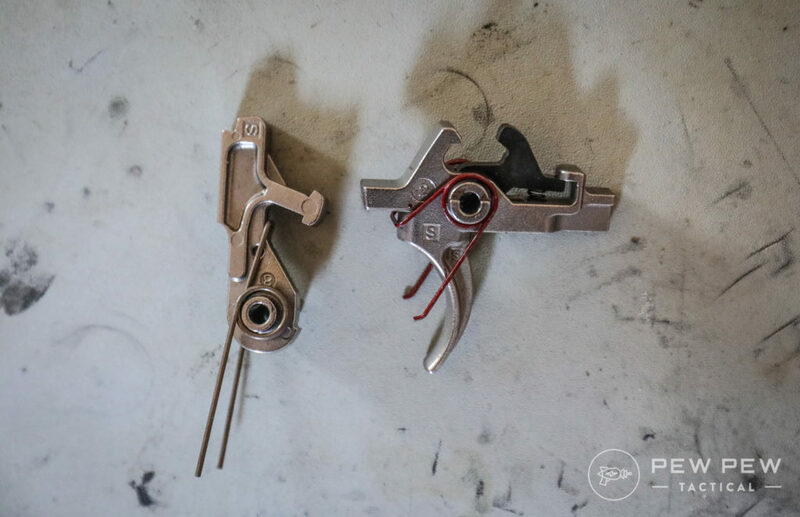 The go-to for a “better” mil-spec trigger is the ALG ACT ($75) which is close to its military brethren but is coated in nickel boron and surfaces are polished. The coating gives it the matte gray color and better surface properties. And although sear surfaces are polished…the angle is kept the same for maximum reliability. What I like to put into important “duty” guns where I want a better trigger but #1 is that the gun always goes bang. 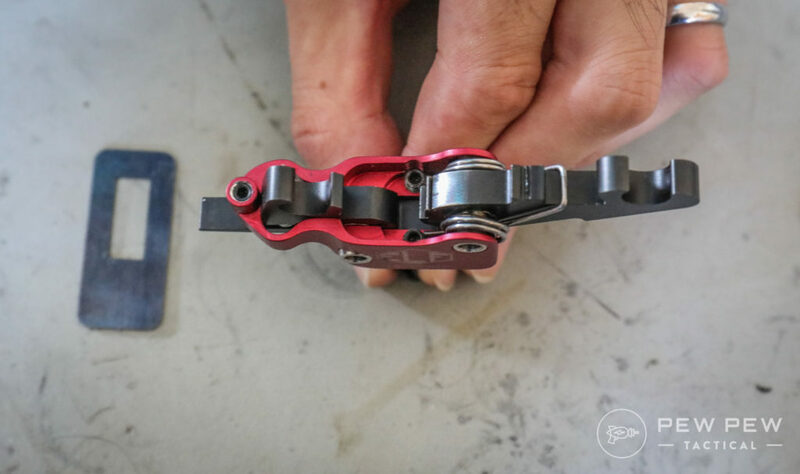 You’ll see in the video that the trigger pull is more consistent with less creep and travel in the beginning…plus a cleaner break. I measured my version at 6 lb 15 oz but it felt less than the tested mil-spec one. It’s normally supposed to be around 6 lb. The three split times averaged out to .20 sec which is better than the mil-spec but you’ll see the benefits in slower accurate fire. 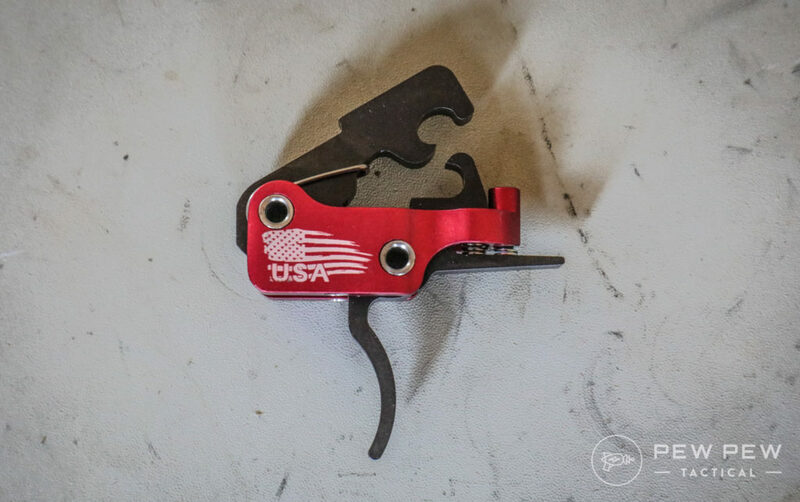 The first drop-in trigger in our series is Rise Armament’s Super Sporting Trigger ($120). I love it since it’s around the $100 mark (and sometimes less) at a time when most drop-ins are over $150. Comes with two receiver set screws that keep it tight with no wiggling. A little annoying to install since it uses regular springs that get in the way of the screws. But how is the trigger? There’s a very small initial take-up and a decently clean break with not that much post-travel. Pull weight was also very consistent 4 lb 2 oz for me while the listed weight is 3.5 lbs. Reset is good and followup trigger pulls are very similar to the initial pull. What I’d recommend for the best bang-for-the-buck entry into the drop-in trigger game. Especially when it’s on sale. 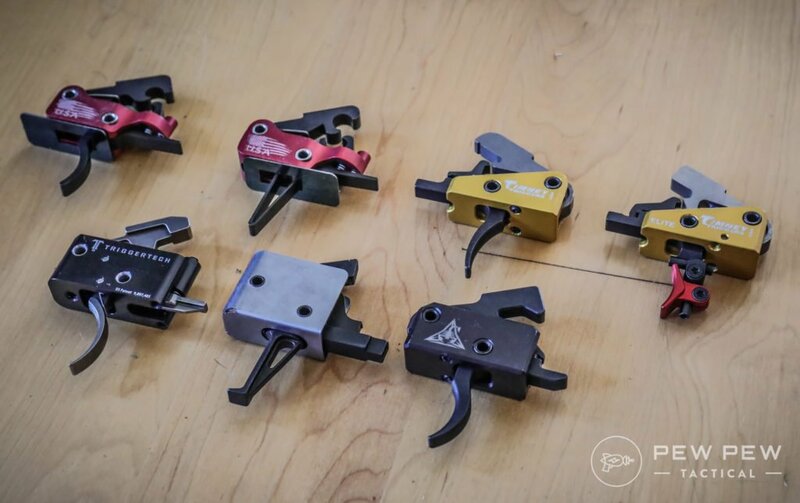 CMC triggers were one of the first drop-in triggers available…and now they have Single Stage 2.5 lb ($168) flavors in addition to the original 3.5 lb version. It’s not a looker from the outside with its sheet-metal-esque enclosure…but the trigger had a consistent 2 lb 1 oz trigger pull and a clean break. No perceptible creep on my flat-faced trigger (also available in curved) but there was no way to tighten down the module to prevent rattling. I’ve heard of people putting something firm but compressible underneath to prevent movement. Not a lot of post-travel and a good hearty reset. Followup trigger pulls also had no discernible creep. 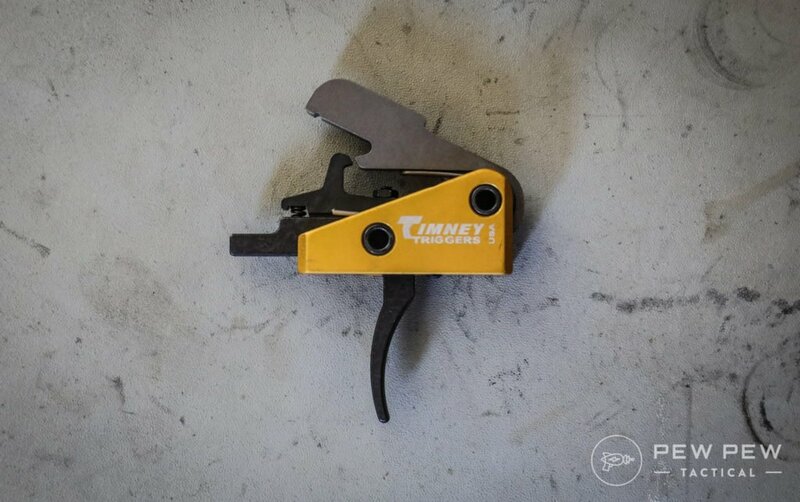 Timney is a stalwart in the AR-15 drop-in trigger world with several models…let’s take a look at their Competition Trigger ($215). I chose the 3 lb version but they also have higher weights too. Install was easy with their own tool to avoid the springs and tighten the set screws. 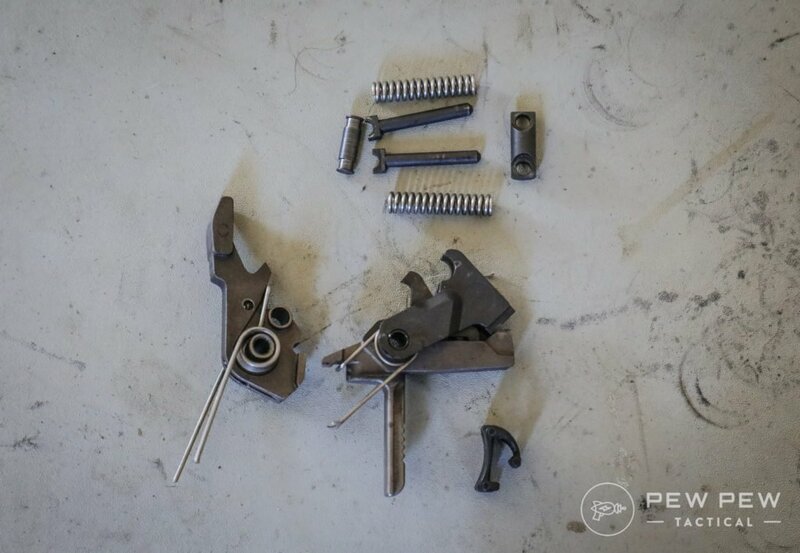 I recorded the trigger pull at 3 lb 5 oz…very close to the stated pull weight. There was almost no pre-travel combined with a clean break. Also very little post-travel. Decent reset before getting back to the no creep single stage. Ok speed at .205 seconds for me. 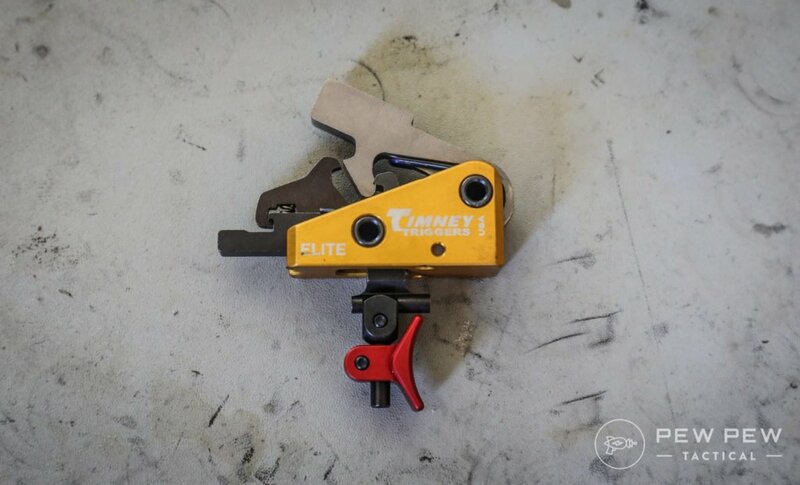 The high-end of the Timney line is the Calvin Elite ($269)…named after their trigger designer. 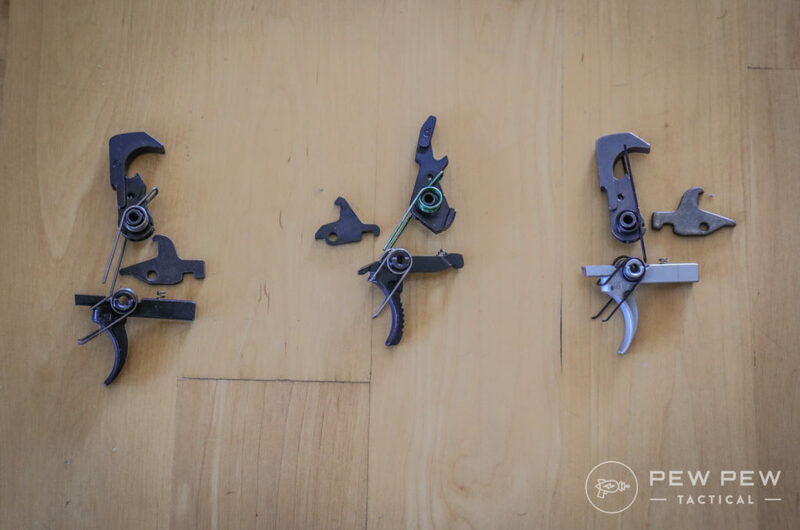 It also looks like no other trigger out there with its fully adjustable position in both horizontal and vertical directions. I liked mine as rear and high as possible. Oh…and the stated weight…a truly hair trigger pull of 1 lb 8 oz. And mine was super close to the stated weight with 1 lb 9 oz. There’s no creep and a super loud reset before going back to the lightest trigger in this roundup. Splits were also blazing fast with me getting one at .09 sec and averaging out to .115 seconds! What do you think of the Calvin Elite? 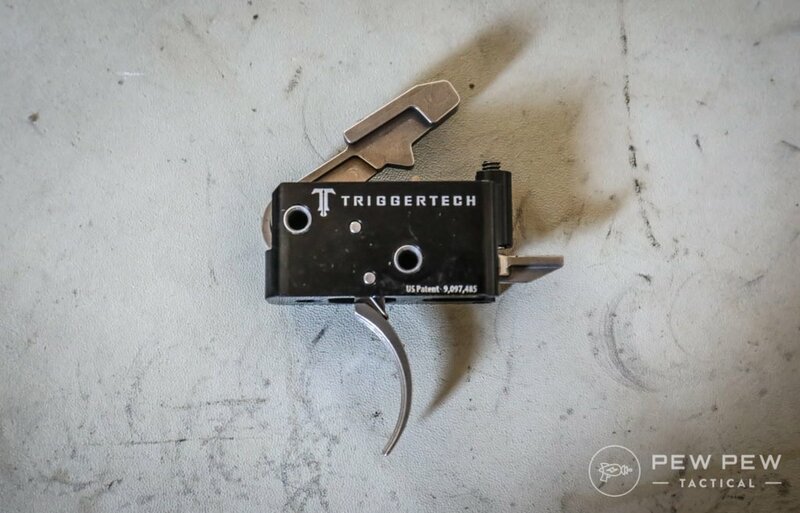 Let’s dive into a high-tech 2-stage trigger with Triggertech’s Adaptable AR Primary ($239). 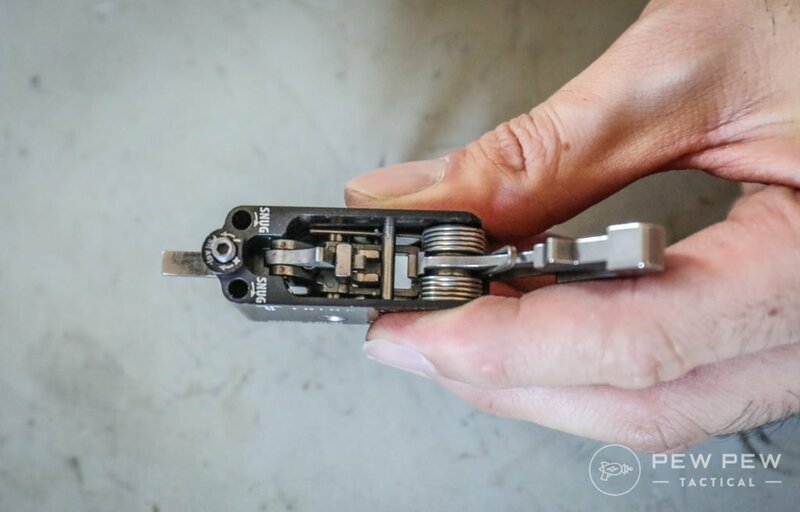 What exactly is a 2-stage trigger? It’s what it sounds like…the first stage is a light pull with no creep…in this case I measured it to be a consistent 10 oz. You take up that slack and then the second stage becomes lighter because you already helped it out. Triggertech’s adjustable model got me between 3 lb 3 oz to 7 lb 2 oz in total pull. So for my specific trigger it was 1st stage 10 oz and 2nd stage 2 lb 8 oz. It was also the easiest to adjust both trigger pull weight and receiver set screws. Audible clicks for the trigger pull…and no springs blocking the set screws. Check out the nice 1911-esque first stage and clean break with minimal post-travel. I messed up the split times a little since it’s a two-stage trigger and not really meant for super rapid fire. But I think the .24 sec time is representative. If you’re going with a 2-stage…you’re most likely going more precision. You can still shoot quickly but it excels in a super light second stage. Highly recommended if you want an adjustable trigger that can work for 1000 yards and also more duty-like jobs if you up the pull weight. Also available in non-adjustable flavors. The affordable version of Geiselle’s venerable SSA series ($240) of 2-stage triggers but comes in at $99 for the PSA 2-Stage. Not quite as smooth feeling as Geiselle’s…but at 68% off…I can deal with it if I need a decent precision rifle trigger. I got a pull weight of 2 lb 8 oz for the first stage and 1 lb 15 oz for the 2nd stage for a total of 4 lb 7 oz. Listed is 1.75 lb for both stages. There’s some creep after the initial first stage but the break is pretty clean. Reset is also a tad long but very tactile so you know it happened. You can see that it shoots pretty quickly in rapid fire because both stages were close in weight and I treated it like a regular trigger. However my shot timer didn’t pick it up and I was running out of blanks. 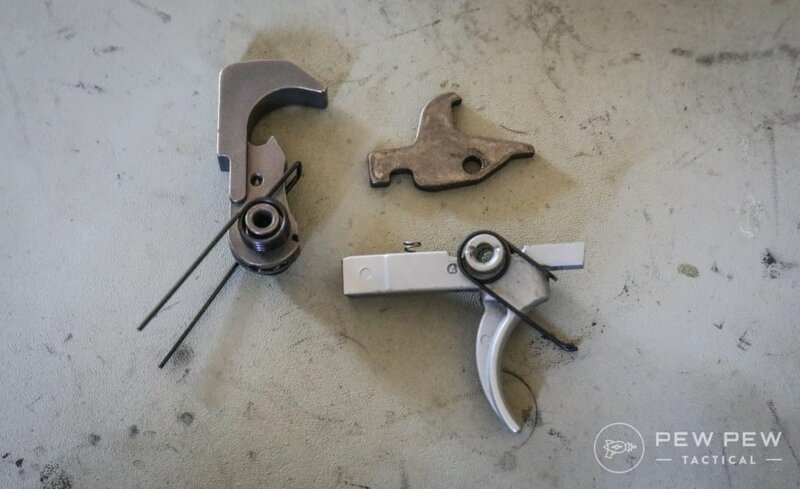 ELF is short for Elftmann who make some of my favorite drop-in single-stage triggers that are silky smooth due to sealed ball bearings. The ELF SE ($162) is their most affordable line which isn’t adjustable but is rated at 3.5 lbs. However when I measured I got 4 lb 3 oz. I opted for the curved trigger but you can get a flat one too. 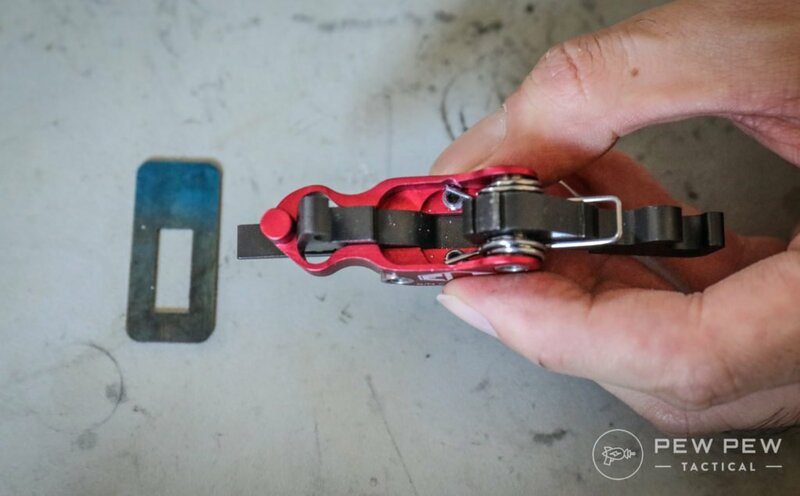 It comes with a shim to protect your lower because there’s two set screws you tighten to make sure the drop-in unit is not going anywhere. I highly recommend putting some Blue Loctite on the screws when you’re sure you’re going with the trigger. Especially if you’re shooting higher recoiling rounds. There’s the slightly bit of creep in the beginning before a crisp break. I had to refilm to get it on camera by pressing super slowly. Very little over-travel and reset is strong and clean. This is going to be one fast trigger as we can see with its .14 sec average split. The ELF 3-Gun ($270) is the top-of-the-line trigger in the series with its adjustable pull weight and super crisp trigger. 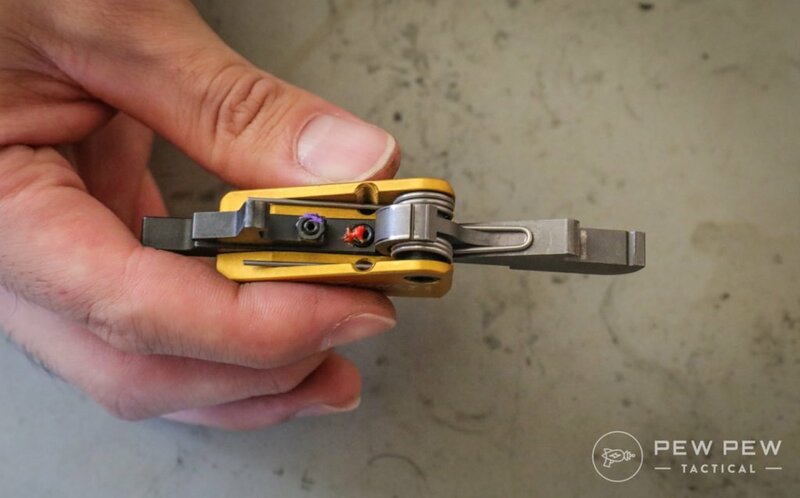 It also comes with the shim and two set screws to lock it securely in place. Plus another screw at the rear to adjust pull weight. It’s rated as 2 lbs 12 oz to 4 lbs…and I got close with 3 lb 3 oz to 4 lbs. You can get it in flat or curved flavors…I opted for the flat one to spice things up and I like the look. I was amazed at the zero creep in the beginning and an even glassier glass rod break. Very little over-travel and strong reset like the SE version. Just about the same split time average as the SE with .145 seconds. Probably well within the error range of my setup. Is it worth the upgrade from the SE? Yes if you want the uttermost least amount of creep possible…and the ability to adjust your trigger pull weight. Lots of fellow competitors run the ELF 3-Gun and I’ve tried ones with much lighter weights…mine might have been a little heavy from the factory or it will lighten up with more use. Summary: No creep, very light trigger, super crisp break…all with little over-travel and a strong reset. No we’re entering Hiperfire…who first came out with very different triggers that brought down pull weight but increased hammer power. The Sharp Shooter ($94) is one of their newer designs which builds upon mil-spec reliability. It installs just like a mil-spec trigger and comes in at a slightly lower than average mil-spec 5 lb 9 oz. There’s two different springs and I went with the lower pull weight should have come in at 4.5 lbs. But in shooting there’s a slight pretravel before a strong break. Then a long-ish reset distance before the strong actual reset. I did have a little trouble shooting it rapid fire since I was used to drop-in triggers before this upgraded mil-spec. I’d estimate the actual splits along the lines of the mil-spec of low .20’s. Summary: No creep, slightly lighter than average mil-spec, strong break, and reset. 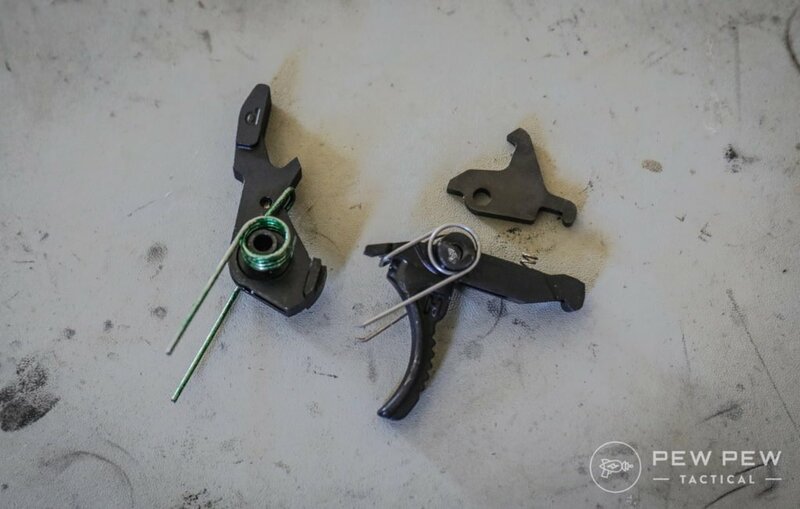 Great upgraded trigger for mil-spec to keep everything in the correct range of pull weight and reliability. But for the price you can get the ALG ACT which is just as good. 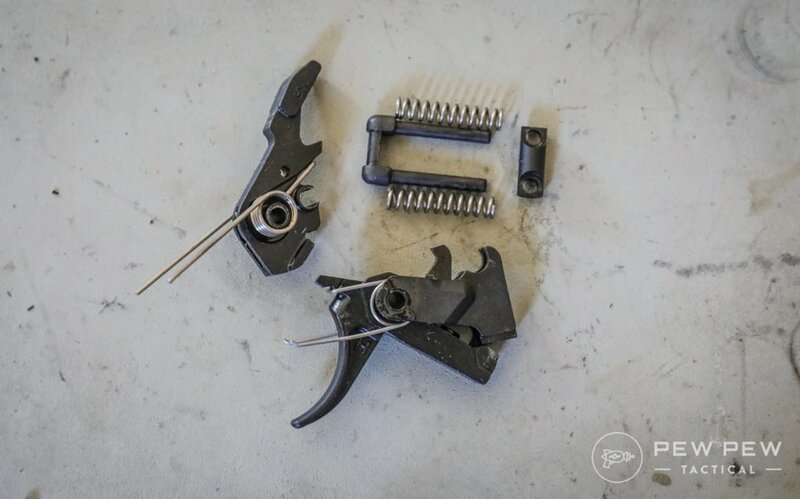 Now we’re talking…this is one of Hiperfire’s most popular triggers…the Reflex ($214). It used to be known as the 243G before Hiperfire cleaned up all their names. You can see that it isn’t a drop-in…and it’s pretty different from a standard mil-spec trigger with its toggle and extra springs. Install is relatively easy when you follow the instructions. Only a step or two more than mil-spec. But all that combined makes a low trigger pull trigger that will set off even the hardest of primers. It also comes with 3 springs for different pull weights…I went with the lightest that measured a very consistent 3 lb 3 oz. You can see there’s very slight pre-travel before a strong hammer strike. It’s weird that the heaviest spring (and heaviest hammer fall) gives the lightest trigger pull. There’s almost no post-travel and a decent reset. Speed is pretty fast for me at .16 sec average. 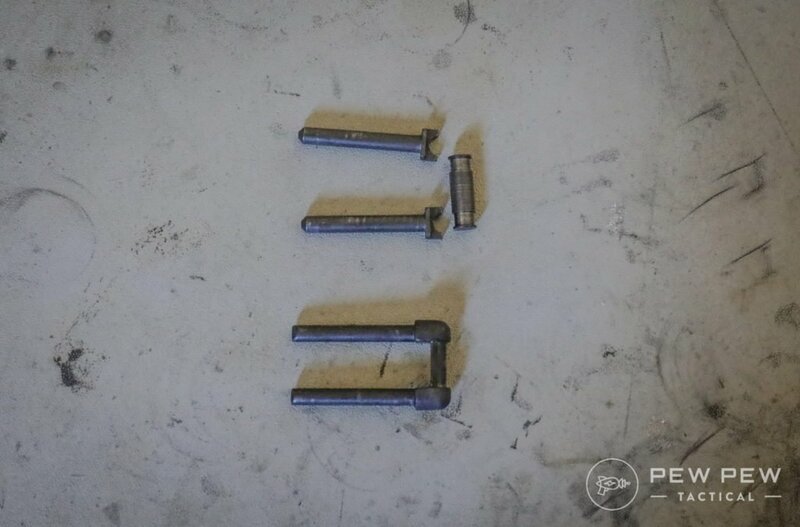 Summary: Slight pre-travel and post-travel with a strong hammer strike. Great for when you need extra ignition reliability. The trigger I’ve been rocking for a long time…and the one that lives in my AR-15 group testing lower…the Hiperfire ECLipse($270). It’s their top of the line version with Nickel Boron coating and an adjustable shoe that can go on the straight trigger. I thought it was gimmicky at first but I’ve learned to really like it…it brings your trigger finger exactly to where it needs to be. The upgrade takes away that initial travel in the Reflex and makes everything slightly smoother with the coating. My version has more parts which made it a little annoying to install…but newer versions like in the Reflex have a single piece toggle. I measured my pull with the heaviest spring/lightest pull at 2 lb 3 oz. You can see there’s no uptake before the strong hammer drop…and almost no wasted post-movement. This is all followed by a short reset. Now for speed I was a little bummed…I thought it would be a lot faster at .21 sec. I know…there’s a lot more triggers out there. But these are some of my favorites and I’ll be updating in the future. 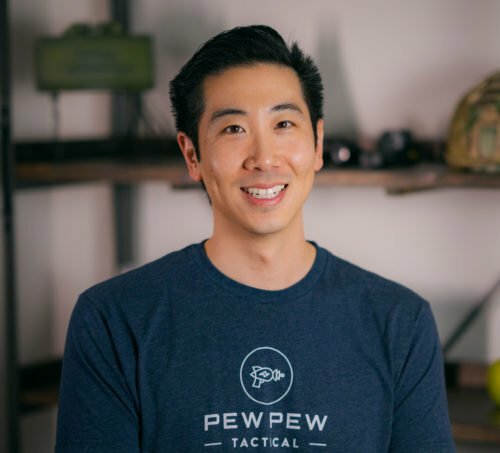 I tried to add in some quantitative numbers but a lot is also subjective…so make sure you know what you’re looking for in a trigger which might be different from me. I like the ALG ACT which has proven reliability and smoother action. At a price that’s reasonable. For Drop-In triggers…it was really tough. My most worth-it is the Rise Armament since you can get it for around $100 around sales times. You get so much for that price. The fastest, lightest, and most adjustable was the Timney Calvin Elite…but it’s also the most expensive. If you want the best performing (at least for me) get it! Another favorite is the ELF 3-Gun since it looks so cool and had a super crisp trigger. 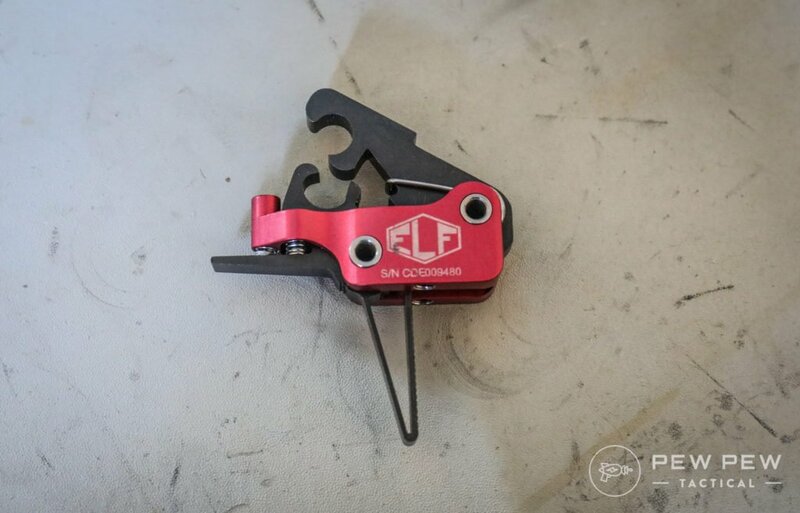 If you don’t want a featherweight trigger but still want speed…get the ELF! I know…the Timney and 3-Gun are $270…for something middle of the road if you don’t mind not having receiver set screws…I really like the 2 lb 1 oz trigger of CMC. 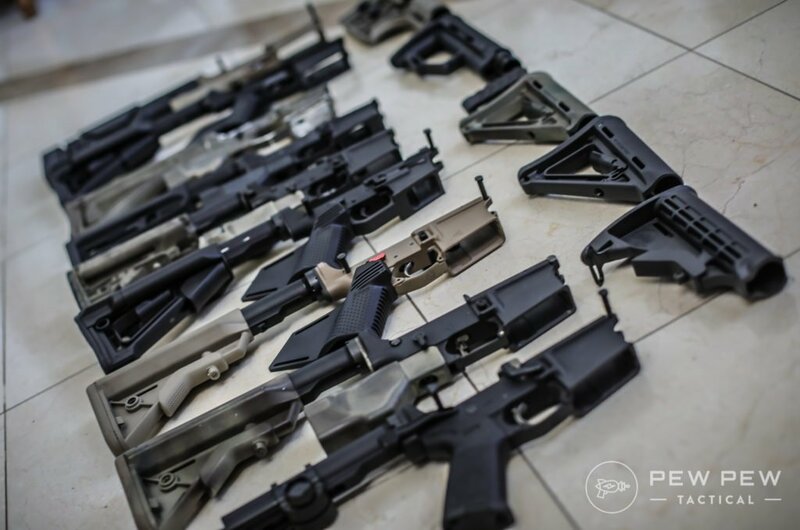 Even though we only had two…I like the PSA 2-stage as a worth-it pick especially if you have a starter AR-10 and don’t want to spend the same amount on your trigger as your upper. But my favorite is the Triggertech Drop-In…it truly did feel like a super nice 1911 trigger. 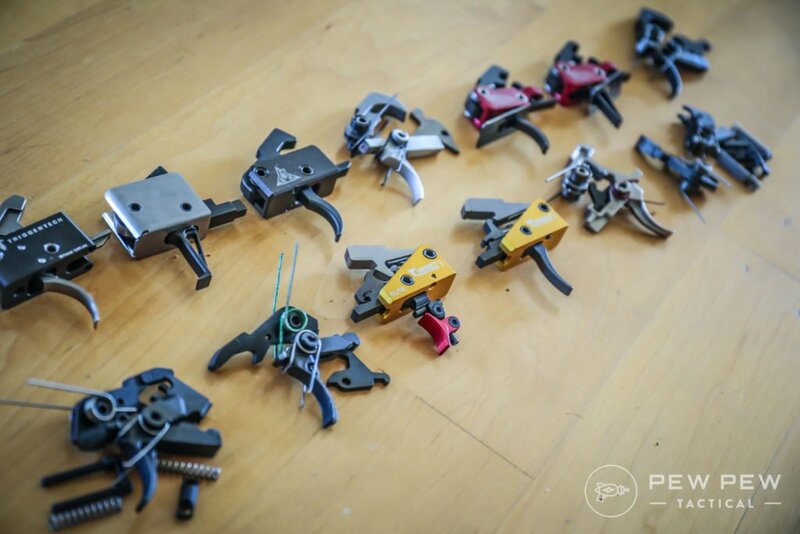 If precision is the game and you like the feel of 2-stage triggers…you can’t go wrong. And for the “other” category…aka Hiperfire. I’m meh about the Sharp Shooter because of its price. But I really like the Reflex…but would recommend spending a little more to get the top of the line ECLipse. It’s served me so well in rifle competitions and now precision shooting. It might not be the fastest but it has the least take-up and most powerful hammer strike. 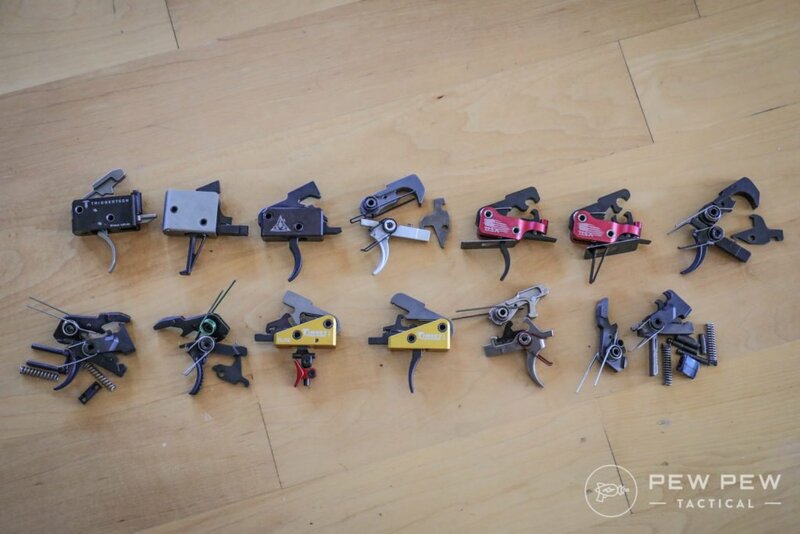 What’s your experience with my favorite AR-15 triggers…do you see one on this list you want to try? Check out more of our favorite gun & gear in Editor’s Picks. I have the Hiperfire 24c (like ECL but without NiB coating), and it is my favorite by far and it sits in my go-to AR15. I just ordered the 2 stage RPS trigger from shootingsight.com and give it a whirl in my B&T P26. It is supposed tos be a one of a kind 2 stage trigger that breaks like Glass. Ive a stock AR10 with HVY mil-spec trigger coming. My first AR15 now has greatly improved with a 3.5# Fail Zero trigger installed. 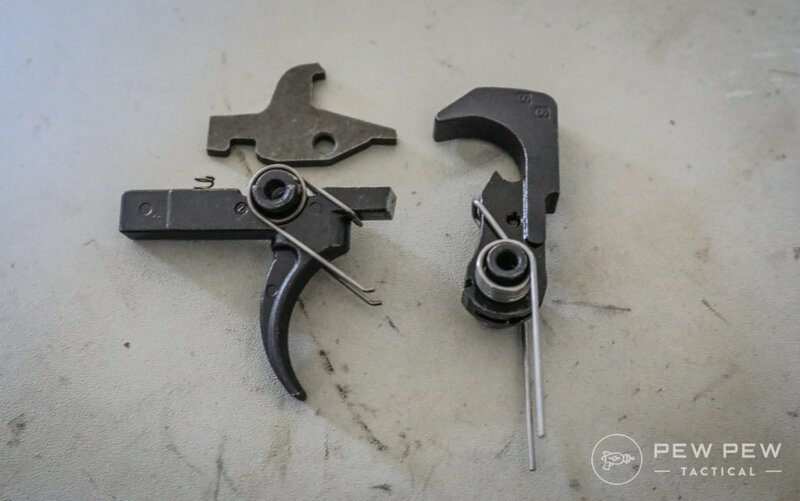 While this FZ trigger is absolutely great Im open to the option of upgrading the 308 with a Rise Armament Super Sporting Trigger. Thanks for the comparison review. Got a little chuckle out of the S&B scope with his favorite ECLipse trigger…and the Anderson receiver. Maybe that’s to balance all of the haters calling him a brand snob. It’s like being called a racist by some liberal and then saying, “I had a black friend in college!” to prove you’re not a racist. Maybe the AR diversity-inclusion police made him do it. Or maybe there are some things where brand just doesn’t matter. $3500 scope on the $35 receiver. But if it works, hey. Who cares.